Battery Warehouse is a family run business with the best quality and selection of batteries in the area. Call our toll free number and we can answer your question, find your battery and ship it to your door. If visting us our location is convenient from all parts of Baltimore County Maryland including Cockeysville, Timonium, Dundalk MD, Arbutus, Butler, Catonsville Maryland, Essex, Garrison, Glyndon, Hereford, Hunt Valley, Lutherville, Middle River, Sparrows Point, Owings Mills, Parkton, Perry Hall, Pikesville, Randallstown, Rosedale, Sparks, Edgemere, Towson, White Marsh, Millford Mill, Windsor Mill, Woodlawn and Reisterstown MD. Our location stocks 100's of batteries and is worth the drive from Baltimore for our great prices and professional service. Stop in with your battery questions and let them show you why they are #1 in Quality, Service and Price. 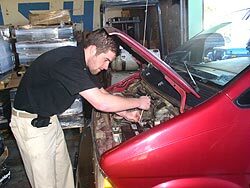 Professional battery installation for cars, trucks, suvs, watches, motorcycles and more is never a problem.